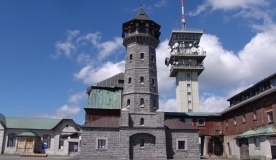 In Boží Dar and its surroundings you have a choice of several ski slopes. As for as their difficulty, they can be recommended to beginners, families with children and more advanced skiers as well. Some skiing slopes can be accessed directly from your hotel or guest house. Ski-busses, ski lifts or chairlifts will take you to the more distant ones. Enjoy good-quality snow on several tens of kilometres of slopes of varying difficulty. Take advantage of additional services such as ski rentals, ski schools, buffets, etc.